Note: not all Prestige releases made it to Esquire, and not all Esquire releases were of Prestige recordings. Esquire 32-193 Danny Alvin Kings Of Dixie Play Club -Basin St.
Another copy has surfaced on eBay today with full photos of both labels saying 32-196 Esquire but once again there is no outer sleeve.I wonder if it is a test pressing of an LP that was neber issued. It is jazz, by the way, Dixieland jazz! At the end of the life of Esquire, it is entirely possible there were aborted projects, it would be unusual if there wasn’t. They are left as a monument to doing things right, when the world moved on to doing things wrong. 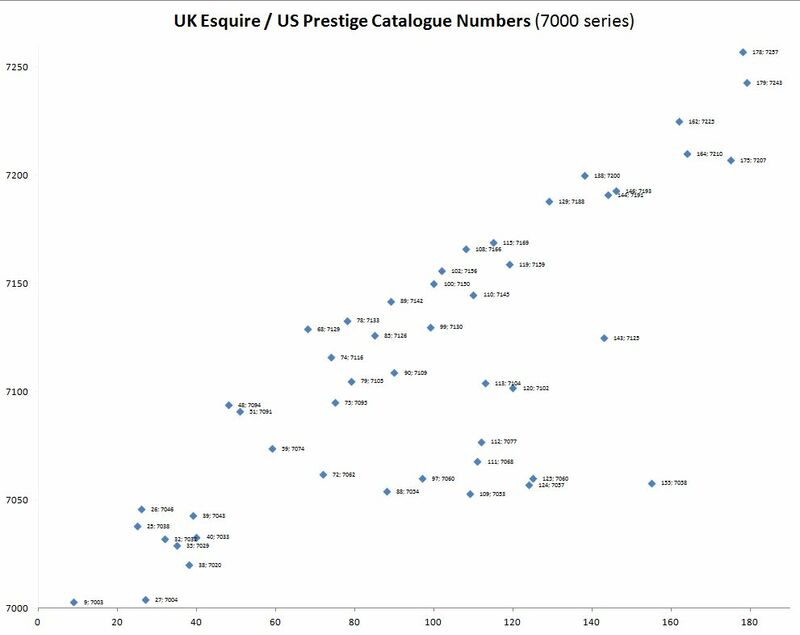 The successor to Esquire’s Prestige distribution license, the Transatlantic Xtra label, are dogged with noisy inferior quality pressing. I see you don’t have details of 32-196 and 197. 196 is a bit of a puzzle as it is supposed to be “Screamin'” by Jack McDuff and is listed as such in the 1963 Jazz Catalogue published by Jazz journal, but I have never been able to find a picture of its sleeve. Contrariwise there was a picture of a seemingly home-made sleeve of 32-196 containing a record with an Esquire label but it was of The Storyville Stompers and the LP’s title was “Riverboat rambling with the Storyville Stompers”. Unfortunately the photo wasn’t very good and it is difficult to make the label out. I have never been able to find another photo of this either. The Jack McDuff 32-196 was not reviewed in The Gramophone and when it was reissued in 1967 on Transatlantic (or Xtra?) the Gramophone review didn’t mention a previous British issue. Does anybody know the truth about this? Hi and thanks for the input. In the death-throws of Esquire it is clear they started a few desperate local publishing efforts, to no avail, as they went under just the same. I maintain a purposeful blind spot on their non-jazz titles, but always willing to add stuff for the sake of completeness.